Whenever I roast a chicken, I make sure I have enough ‘scraps’ left over so that we can enjoy wraps the next day either for lunch or a light evening meal. Although I have been experimenting with making my own, I sometimes use corn wraps or more recently have been using Paleo Wraps which are made from just coconut; coconut meat, coconut milk and coconut oil. Our favourite filling for wraps involves peppery rocket, raw carrot slaw and spicy chicken. Simple, very quick to put together and extremely tasty – bursting with flavour. 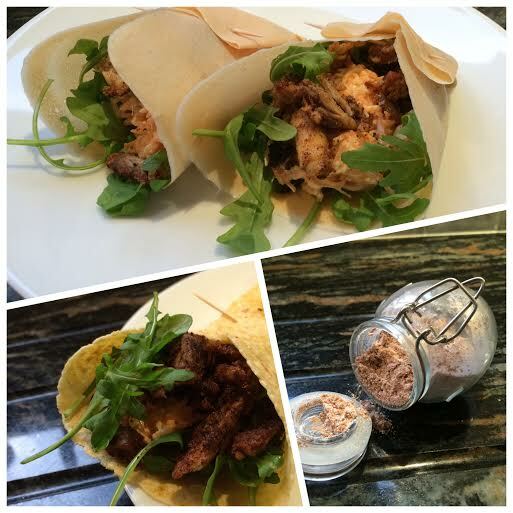 I keep a supply of homemade Fajita seasoning especially for these wraps. 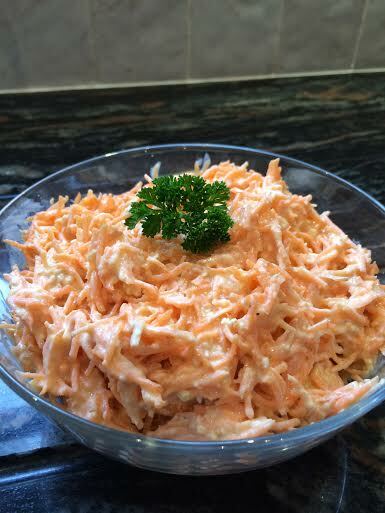 The Raw Carrot Slaw is from the cookbook Get the Glow by Madeleine Shaw and is very quick and easy to prepare. Just mix everything together. To make the wraps – toss left-over chicken in some fajita seasoning and fry quickly in coconut oil until hot and crispy. Warm the wraps; pile up rocket, slaw and chicken and fold up using a cocktail stick to secure. The gingery carrot slaw really seems to bring out the flavours of the spicy chicken and peppery rocket. Enjoy! This entry was posted in Dinner, Lunch and tagged Carrot, Chicken, Dinner, Fajita, Healthy Eating, Lunch, Slaw, Wraps. Bookmark the permalink.